This post is not about leading a group of novice reed makers through the difficult reed finishing process. It is a follow-up to this post where my students formed their own reeds using thin cane* that almost always crows right after you clip the tip. I want my students to have success on their first reed making adventure! Now because I host my reed forming class in November, we combine our reed finishing class with our Christmas party! December is already too full of Christmas concerts and recitals. I choose to have a party instead. Less burden on the students, their parents, and me–and more fun for everyone! I plan a 90 minute class on a Saturday afternoon in December (at least two weeks after the first Reed Party so the reeds can dry). The students show up and we wrap the reeds first thing. 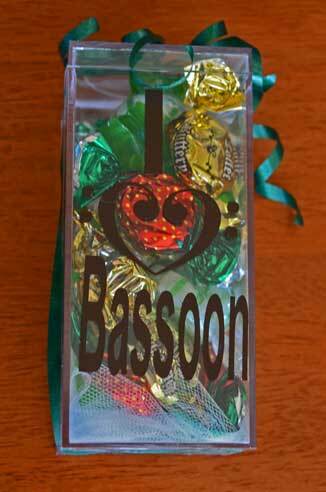 Then while the Duco is drying, we play Christmas bassoon quartets. I have the students rehearse for about 20 minutes and then they perform for each other. The Duco is dry by the time we are done, and we clip the tips. Again, because I use really thin cane*, the reeds play right away and I rarely have to do much finishing. This is a huge highlight for the students. They are amazed that making reeds really isn’t that hard! If some adjustments are needed, I will get the reed to a point where it will at least play. Then during the student’s private lesson I will teach them more about the reed finishing process. *I started out using Charles student cane, but have since switched to cane from Robert Williams (womblewilliams.net). It turns out reliably vibrant reeds that are very encouraging to beginning reed makers! Great! What is the success rate with the cane? Do you teach beyond the Duco/wrapping if cane doesn’t play immediately (the finishing touches portion), or do you usually leave it there and just do the adjustments quickly yourself? With the Charles student cane, about 85% of the reeds worked right away. I’ve now moved on to Bob Williams cane, which has a 100% success rate (although it is more expensive and the reeds will be flat in the beginning). Teaching reed adjusting is much harder than teaching students to form a blank! I usually teach that one on one during the student’s private lesson. I would love to get some of this cane. If the cane doesn’t give the best quality to the students playing are they taught things that they can do to highten their playing with it? If they are a beginning reed maker, I will usually make all the reed finishing adjustment for them. Once they have made a few reeds I will start to let them do the finishing. This cane would be nice for newer students since it is easier to work with. I have found that new students that I have worked with sometimes struggle with their reeds. Great to know! Get the thinnest cane you can find! I’ve now moved on from the Charles student cane to Bob Williams cane. I’m always looking for easier cane for the student to use.